Apple CEO Tim Cook will take to "Mad Money with Jim Cramer" Wednesday evening on CNBC to discuss Apple's latest earnings, and the future of Apple. 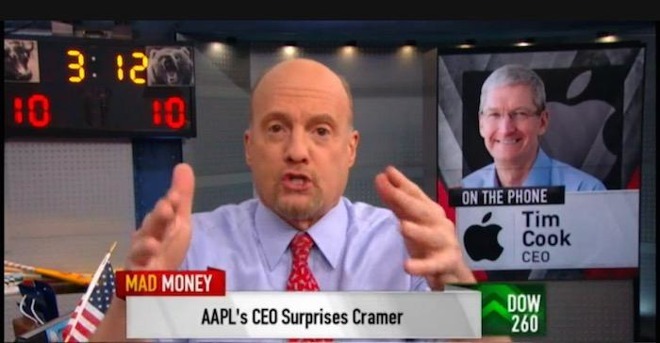 The interview with Cramer will be Cook's third in three years. Previous topics of conversation have spanned the company's expansion into China, Apple's "next frontiers," the company's battles with the FBI, and Apple's seasonal earnings impacts that occur every year at this time. "We're always paranoid. We live paranoid. We always want the very best product. And so if we're not beating someone else we're trying to beat the thing that we have currently shipping," said Cook in a call-in appearance in 2015 on the show. "Everybody here lives on edge." In 2016, Cook noted that Apple had to stand up for consumer privacy, and trust the system to reach the correct conclusions. As in past comments on the matter, Cook said the wider encryption debate needed to be discussed and decided upon by lawmakers and experts, not courts. The appearance airs at 6:00 pm. Eastern time. In previous years, videos of the appearance have appeared a short time after the airing.